HOUSTON, TX—(Marketwired – Dec 14, 2014) – Magnum Hunter Resources Corporation (NYSE: MHR) (NYSE MKT: MHR.PRC) (NYSE MKT: MHR.PRD) (NYSE MKT: MHR.PRE) (the “Company” or “Magnum Hunter”) is reporting today that the Company's wholly–owned subsidiary, Triad Hunter, LLC (“Triad Hunter”), has experienced a loss of control of a well, the Stalder 3UH, located in Monroe County, Ohio. Triad Hunter lost control of this well at approximately 2:00 p.m. EST on December 13, 2014. The previously drilled and completed Stalder 3UH well had been temporarily plugged and abandoned in preparation for the drilling of three additional Utica horizontal wells on the Stalder pad. However, despite numerous precautionary measures taken in connection with the temporary plugging and abandonment operation, the well began to flow uncontrollably while recommencing production operations. Triad Hunter personnel were removing the well's night cap flange when a pressure disruption occurred. They attempted to bolt back down this equipment but were not able to safely do so prior to natural gas flowback. MENLO PARK, CA—(Marketwired – Dec 14, 2014) – Delphix, the market leader in virtual data as a service (vDaaS), today announced that Christopher Poulos has joined the company as Vice President and General Manager of Asia–Pacific Operations. Poulos is a seasoned executive with over 25 years of enterprise sales experience. Prior to Delphix, Poulos was Vice President and General Manager of APJ Operations at Cloudera. Since launching in 2010, Delphix has grown rapidly in North America and Europe. Over 100 of the Fortune 500 rely on Delphix to accelerate key application projects, manage data compliance and security by masking confidential information, and migrate applications to the cloud or onto more efficient IT infrastructure. Poulos has a proven, track record for success in growing international operations for multiple technology companies. Prior to Cloudera, Poulos drove $100 million in annual sales in APJ for Enterprise Security Products for HP. Poulos also held enterprise sales and operations roles at IBM, Microsoft, and Lotus. Poulos is located in Sydney, Australia and is responsible for Delphix operations across the Asia–Pacific and Japan regions. Delphix delivers virtual data on demand, transforming slow, complex, and expensive data management into fast, secure, and automatic data delivery. Delphix provides its vDaaS Platform as on premises or cloud software that quickly and automatically delivers the right data to the right team at the right time, instead of relying on complex processes and multiple IT teams to manually move unsecured data from system to system. Industry leaders across the Fortune 500 use Delphix to accelerate application projects by 2x, increase productive environment cycles by 10x, and deliver secure data 100x faster than manual operations. Delphix is headquartered in Menlo Park, California, with offices around the world. After 13 days of debates, COP 20, the meeting of the parties to the United Nations Framework Convention on Climate Change (UNFCCC), failed to resolve key issues such as the monitoring of each country’s commitment to emissions reductions, recognition of loss and damage caused by climate alterations and immediate actions, representatives of observer organisations told IPS. The agreed document was the third draft to be debated. The Lima Call for Climate Action, as it is known, stipulates that countries must propose national greenhouse gas emission reduction targets by October 2015. It also “urges” developed countries to “provide and mobilise financial support for ambitious mitigation and adaptation actions” to countries affected by climate change, and “invites” them to pledge financial contributions alongside their emissions reduction targets. This exhortation was a weak response to the demands of countries that are most vulnerable to global warming, and it avoided complete disaster. But observers complained that the Lima Call pays little attention to the most vulnerable populations, like farmers, coastal communities, indigenous people, women and the poorest sectors of societies. “There were a number of trade-offs between developed and developing countries, and the rest of the text has become significantly weaker in terms of the rules for next year and how to bring climate change action and ambitions next year,” Sven Harmeling, the climate change advocacy coordinator for Care International, told IPS. “That has been most unfortunate,” he said. The 2015 negotiations will be affected, as “they are building up more pressure on Paris. The bigger issues have been pushed forward and haven’t been addressed here,” he said. Harmeling recognised that an agreement has been reached, although it is insufficient. “We have something, but the legal status of the text is still unclear,” he said. If there is really a “spirit of Lima” and not just a consensus due to exhaustion, it will begin to emerge in February in Geneva, at the next climate meeting, he predicted. More than 3,000 delegates met Dec. 1-13 for the complex UNFCCC process, with the ultimate goal of averting global warming to levels that would endanger life on Earth. Peruvian Environment Minister Manuel Pulgar-Vidal, who chaired the COP 20, extended the meeting in order to build bridges between industrialised countries, the largest carbon emitters, who wanted less financial pressure, and developing countries who sought less control over their own reductions. “Although we seem to be on opposite sides, we are in fact on the same side, because there is only one planet,” said Pulgar-Vidal at the close of the COP. The specific mandate in Lima was to prepare a draft for a new, binding climate treaty, to be consolidated during 2015 and signed in Paris. Methodological discussions and fierce debates about financing, deadlines and loss and damage prevented a more ambitious consensus. “What countries need now is financing of climate action and what we need is urgent action now, because we need our emissions to peak before 2020 if we are to stay on a safe path,” Tasneem Essop, climate coordinator for the World Wide Fund for Nature (WWF), told IPS. “We need to protect the rights of climate impacted communities,” she said. The defencelessness of the most vulnerable people on the planet is what makes action a matter of urgency. However, the Lima agreement contains few references to mechanisms for countries to use to reduce their emissions between 2015 and 2020, when the new treaty replacing the Kyoto Protocol is due to come into force. These actions need to start immediately, said Essop, as later measures may be ineffective. “What governments seem to be thinking is that they can do everything in the future, post 2020, when the science is clear that we have to peak before that,” she told IPS. Unless action is taken, year by year extreme climate, drought and low agricultural yields will be harder on those communities, which bear the least responsibility for climate change. Essop believes that governments are waiting for the negotiations in Paris, when there were urgent decisions to be taken in Lima. Among the loose ends that will need to be tied in the French capital between Nov. 30 and Dec. 11, 2015, are the balance to be struck between mitigation and adaptation in the new global climate treaty, and how it will be financed. 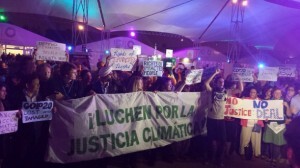 “If we hadn’t come to the decision we have taken (the Lima Call for Climate Action), thing would be more difficult in Paris, but as we know there are still many things to be decided bewteen here and December 2015, in orden to resolve pending issues,” Laurent Fabius, the French Foreign Minister, said in the closing plenary session. The goal of the agreement is for global temperature to increase no more than two degrees Celsius by 2100, in order to preserve planetary stability. Reduction of fossil fuel use is essential to achieve this. Mitigation, adaptation, and loss and damage are the pillars of the new treaty. The last two issues are vital for countries and populations disproportionately impacted by climate change, but faded from the agenda in Lima. “It’s disastrous and it doesn’t meet our expectations at all. We wanted to see a template clearly emerging from Lima, leading to a much more ambitious deal,” said Harjeet Singh, manager for climate change and resilience for the international organisation ActionAid. “What we are seeing here is a continuous pushback from developed countries on anything related to adaptation or loss and damage,” he told IPS. These are thorny issues because they require financial commitments from rich countries. The Green Climate Fund, set up to counter climate change in developing countries, has only received 10.2 billion dollars by this month, only one-tenth of the amount promised by industrialised nations. The Lima Call for Climate Action did determine the format for Intended Nationally Determined Contributions (INDC), for each country to present its emissions reduction targets. However, the final agreement eliminated mechanisms for analysing the appropriateness and adequacy of the targets that were contained in earlier drafts. Negotiators feel that the sum of the national contributions will succeed in halting global warming, but observers are concerned that the lack of regulation will prevent adequate monitoring of whether emissions reductions on the planet are sufficient. دبي، الإمارات العربية المتحدة- (Marketwired – 14 ديسمبر 2014) – سوف تقدم VidSys، الشركة العالمية الرائدة في مجال برمجيات إدارة المعلومات الأمنية المادية (PSIM)، عرضًا وتشارك بإصدارها 7.7 في معرض Intersec Dubai الذي سيقام في الفترة 18-20 يناير 2015، في الجناح S1-A50. وقد بدأت PSIM كمنصة متكاملة لمراكز التشغيل من أجل تحسين المعرفة بالمواقف باستخدام مستشعرات وبيانات أمنية مادية. وتتطور الشركة الآن بشكل سريع لتضمين مصادر البيانات الأخرى، بما يشتمل على إدارة المباني، وأجهزة الرادار/السونار، وتتبع الأصول، والوسائط الاجتماعية، وأمن تكنولوجيا المعلومات، وأنظمة الإدارة. وبالإضافة إلى هذا فإن VidSys PSIM هو عبارة عن حل قابل للتهيئة وجاهز للعمل (COTS). وغالبًا ما يؤدي تنفيذ برمجيات PSIM إلى عائد قوي على الاستثمار. وتشتمل الوفورات التي يتم تحقيقها على كفاءة أفراد العمل، وتقليل الإنذارات الكاذبة وتحسين التوافقية والالتزام بالمتطلبات التنظيمية. وفي هذا السياق، قال فيل استوكهولم، مدير العمليات في أوروبا، والشرق الأوسط، وأفريقيا "لقد عملت VidSys في الإمارات العربية المتحدة على مدار خمس سنوات ومؤخرًا قامت بإنشاء مقرها الإقليمي في دبي. وكجزء من التزامنا تجاه منطقة الشرق الأوسط، فإننا حاليًا لدينا فريق عمل في الإمارات العربية المتحدة، والسعودية، والبحرين، وقطر. "كما أن VidSys لديها مراجع إقليمية في Safe City، والبتروكيماويات، والمؤسسات، والقطاعين الحكومي والصناعي، وكذلك لديها أعمال ناجحة في خدمات الأفراد، والضيافة، وتنفيذ القانون. وسوف تقدم Intersec منصة رائعة لنا لعرض برمجيات PSIM وإننا نتطلع إلى مشاركة رؤيتنا على العديد من التركيبات الإقليمية." وفي عام 2014، فإن VidSys قد قامت بتوسعة أعمالها في الولايات المتحدة، وجنوب ووسط أمريكا، والشرق الأوسط، ومنطقة آسيا والمحيط الهادئ. ويلبي إصدارها الأخير من البرمجيات 7.7 معايير جودة المعلومات الفيدرالية الأمريكية، بما يشتمل على الامتثال لقانون إدارة أمن المعلومات الفيدرالية (FISMA) واعتماد جودة المعلومات وعملية المصادقة لـوزارة الدفاع الأمريكية (DIACAP)، والتي يتم تطبيقها في إطار عمل موسع لإدارة المخاطر كما هو معد من قبل معهد (NIS) TNational Institute of Standards and Technology. وتشتمل البرمجيات على قدرة نمذجة ثلاثية الأبعاد، والتي تعتبر فريدة من نوعلها لـ VidSys وقد أصبحت أكثر انتشارًا لاسيما في الشرق الأوسط. لحجز اجتماع أو عرض في المعرض، الرجاء الاتصال على 059 319 557 (0) 971+ أو زيارتنا في الجناح S1-A50. دبي، الإمارات العربية المتحدة– (Marketwired – 14 ديسمبر 2014) – سوف تقدم VidSys، الشركة العالمية الرائدة في مجال برمجيات إدارة المعلومات الأمنية المادية (PSIM)، عرضًا وتشارك بإصدارها 7.7 في معرض Intersec Dubai الذي سيقام في الفترة 18–20 يناير 2015، في الجناح S1–A50. لحجز اجتماع أو عرض في المعرض، الرجاء الاتصال على 059 319 557 (0) 971+ أو زيارتنا في الجناح S1–A50.